New methods for accurate and dynamic pricing? 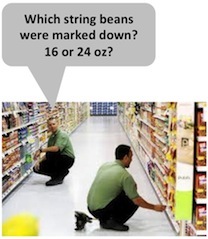 Jeans, or even string beans, have huge price variability. And with online shopping continuing to grow, traditional merchants have had to roll out price-matching methods to keep business—or else. On that theme, our MIT RFID group recently visited E Ink, a leading provider of electronic paper. Retailers have many challenges—both strategic and tactically—in pricing. First, there is determining the price. The second challenge is how does a retailer physically change prices several times a day as ecommerce or the big box merchant down the street decides to change their price? Stock clerks have a challenge in keeping up with replenishment, ticketing, and accurate pricing, as it is. Weekly specials see stock clerks manually repricing or placing special signage with the merchandise and throughout the store. Promotional ads, in-store signage, and end caps are often out of sync, misprinted, or don’t fit with the special shelf or floor space. If there are any printing errors, the signs are headed for the garbage bin before they are even used. What is more, apparel and other floor-ready merchandise shipped from Asia already have tickets on them. That price might be wrong before these goods even enter the market. Enter dynamic pricing! Just as the airlines have been price adjusting/optimizing in order to compete, the competition for profits and sales in the retail world is getting intense. And to debunk the myth on low prices—it isn’t always the lowest price that makes a business more competitive. It’s the right price: the highest price you can ask while winning the most business, and that price can change by the hour. Many of you may have seen this graphic from the Wall Street Journal. It shows hour-by-hour pricing changes as retailers adjust their prices. It depicts what traditional retailers vs. etailers may really be up against when it comes to pricing. Many manual processes just can’t keep up. Enter electronic paper! This is the same technology we have on our e-readers, Nooks, and Kindles. Electronic paper is now being deployed as Electronic Shelf Labels or ESL. The ESL market is heating up not only in support of the tactical challenge of quickly deploying accurate pricing in the vast caverns of the retail floor, but also in being the instrument to support dynamic pricing. Etailers have the advantage with dynamic pricing since once their pricing engine says make a change, they have only ‘one place’ to make that change—digitally—on their web catalogue. Store operations, on the other hand, can have from 100 to thousands of stores in which to adjust pricing. Manually, it’s not going to happen. If shoppers are price aware—and they surely are when it comes to the big ticket items—they will walk. However, with an electronic pricing system, instant change! You can change many prices across a department relatively quickly. Many retailers are implementing systems based on LEDs for electronic signage. E Ink pointed out that this new generation of signage based on electronic paper is cheaper, easier to read, and a low-power option. “Electronic ink is made up of millions of tiny microcapsules, about the diameter of a human hair. Each microcapsule contains positively charged white particles and negatively charged black particles suspended in a clear fluid. When a positive or negative electric field is applied, corresponding particles move to the top of the microcapsule where they become visible to the viewer. This makes the surface appear white or black at that spot.”1 Amazing! The backplane is a flexible and light polymer material, so displays can be malleable and cut in many sizes to make large or quite small and inexpensive signs. Of course, our MIT comrades asked all the right technical questions about how far and where electronic inks and papers can go in the future. Although we envisioned a world beyond retail, the market is hot right now for a firm like E Ink in the retailer sector. Flexible, electronic, low-power visuals are popping up in many applications. Another example we saw last year at MIT’s RFID Expo was from Omni-ID and their ProVIEW visual RFID solution for manufacturing. The value proposition in manufacturing is quite strong (read about that in the blog from RFID 24-7 here). 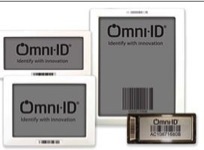 With Omni-ID’s system, both RFID ‘waves’ and visual instructions accompany equipment, conveyances, etc. Then automatic processes engage, but the employee/people role in the process is also acknowledged. There may be specific instructions that are involved in the use of the item. That can be addressed, for example, where workers need instructions to complete work steps, or where products and bin labels need to be changed. Visual tagging is particularly useful in our multi-language supply chains. Having done projects in plants where workers were from Vietnam, Laos, Mexico, Southern India, Pakistan, and Western Massachusetts—all in one facility, all still speaking their mother tongue—visual paper-based instructions are almost impossible to cope with. Auto-ID does not rely on written instructions to be processed. There are many day-to-day uses of visual tagging within manufacturing, what to say of other industry applications. New, more versatile devices with lower cost of ownership are hitting the market, from high-memory and sensor-rich RFID to visual tagging, e-paper, e-inks and ultra-thin films. High-volume manufacturing is giving way to small scale (but inexpensive) manufacturing. In this climate, diverse ideas can flourish and be brought to market. A final note—in the last few years the University of Lowell has invested in a Nanomanufacturing Center and is now opening a Printed Electronics center there as well. Many universities are in the advanced manufacturing sphere, funded by private/public funds. These make great places to launch the next big idea. What’s yours?